Staff was friendly and helpful. Rooms were confortable and clean. Finally I spent a relaxing evening at the terrasse of the restaurant. 4 star ibis or a 3 star Mercure. Our room was quite good and we had a very interesting and good evening meal in the restaurant. However, the Mercure hotel facilities blurred into an Ibis. The room was comfortable and clean. Receptionist spoke good English and explained things well. Restaurant staff were rather cool in manner but responded to requests efficiently. However, I do think I should not have had to ask for bread and water at dinner; they should have been put on the table when we sat down. Thje rooms are decorated in the 80's style but the price is up to date. Very expensive for such a poor quality. In the same building are Ibis and Mercure : the level of service is for Ibis, even if you pay the price of Mercure. Uggly location. Poor, outdated decoration. We stay here a lot, the hotel says it’s a Mercure but seems to be an Ibis with a Mercure tagged on. Most guests seem to stay in the ibis but use the facilities of the Mercure, I have never stayed in the ibis part but I guess the rooms are he same! At breakfast their was not much food available when I requested more they go some from he Ibis breakfast room and soon took it back when we had finished. It appeard that they did not have many guest in the Mercure. I would suggest that the hotel becomes one brand or the other as currently it appears to be confused and not up to the usual standard you expect and normally receive from the Mercure brand. Comfortable and Affordable in P.! After a mixup at the check-in (sent to rooms that weren't cleaned yet)), we had a perfectly nice stay. The hotel is comfortable, modern, and adequate for a one or two night stay. We were here earlier in the year and found it a bit less well managed now, perhaps because it was off-season. How can this be a 4 star hotel with such a restaurant??!! The reception service was typically Mercure as was the bedroom accommodation but certainly no better than many 3 star Mercure hotels we have visited. The restaurant was among the worst we have ever visited in France or the world. The menu had no relationship to the hotel's 4star rating and the service, especially at dinner, was very surly and haphazard. One of our main course choices was a chicken burger which was served with a badly burnt bun - we have photographic evidence of this!! When pointed out to the server it was received with a sigh and a reluctant offer to change it!! After our first night experience in this restaurant if the hotel had not been located in the middle of an industrial zone and surrounded by noisey roadways making a journey into the town centre either by car or foot a very unpleasant prospect we would have certainly found a far better dining option even if it had been Macdonalds !!!!!! Free secure parking at the door of the hotel, very clean and comfortable room and beds, delicious fresh breakfast served by friendly accommodating staff, evening restaurant which substituted and accommodated our allergies and preferences perfectly, beautiful grounds with gardens, pool and tennis courts and easy proximity to gas station and highway to Avignon and the Luberon region. We stayed here for two nights which gave us enough time to drive and visit the region and its many beaux villages. 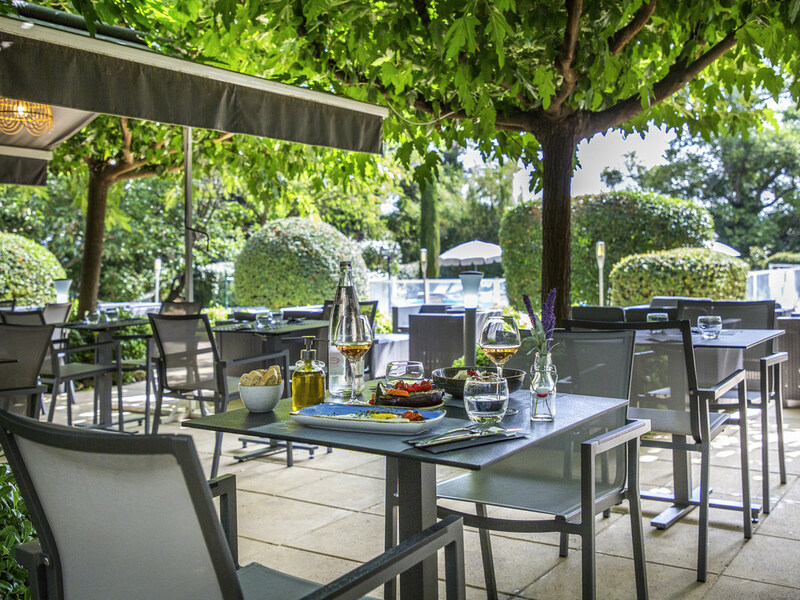 The Mercure in Cavaillon is OK, rooms are OK and the terrace and pools are very good. Now from a guest experience standpoint, we experienced issues with wifi being extremely weak to even not working at some occasions and the same applied to some TV channels. We had booked with Accor hotels and assumed that we had a bed breakfast and an evening meal waiting for us at this hotel. When we arrived the member of staff who greeted us said that they were fully booked and only realised when we booked in on line that morning. The staff managed to find us a room by asking another guest to go to another hotel. By chance we asked if we should book for dinner. They were no sure, but in the end we were given the dish of the day. This was a worrying experience for us as I am disabled and we need to book in advance. The staff could not have been more helpful. How can we avoid this happening in the future? Very nice staff but very, very poor room. Have had experienced better Ibis standards. The existing desk in the room wasn't even large enough to be used as a working place. No sockets were available, have had to unplug the ironing board in order to connect the laptop.